This week we start a new series featuring candid conversations with some of Central Ohio’s finest jazz musicians. First up, we have the honor of learning more about one of the finest jazz bassists in the city, Andy Woodson. Andy has been a staple of the Central Ohio jazz scene for over 20 years, having performed and recorded with many elite jazz performers including: DD Jackson, David Murray, Billy Hart, Vince Andrews, Hank Marr, Bobby Floyd, Jack Wilkins, Kim Pensyl, Mark Flugge, the Columbus Jazz Orchestra, and the Woody Herman Orchestra. 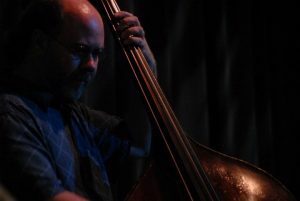 Andy is currently a lecturer of jazz bass at The Ohio State University, where he received his BA in Music Performance in 1989. AW: I started playing bass guitar in 1977, went pro about 1985. I was a rock/pop guy in my teens, and started getting interested in jazz though artists like Weather Report, Dixie Dregs, Allan Holdsworth, Brand X, Mahavishnu, etc. AW: At first Jaco Pastorius, Stanley Clarke, Percy Jones, Anthony Jackson and many others. Really too many bassists to mention, I’m just a fan of anyone who plays the instrument passionately and musically. Many of my biggest musical heroes aren’t bass players: Joni Mitchell, Frank Zappa, Peter Gabriel, and Michael Hedges to name a few. These are uncompromising artists who follow their vision, ignoring popular trends. AW: Seeing Zappa’s band in 1977 and in 1988. AW: Great players who care about the craft of music, a good amount of talented and open minded artists. AW: Performing as much as possible, as well as writing some new material for various projects, bands like FLIPPO and Magically Delicious. I’m also hoping to finish mixing some previously unreleased recordings of Columbus area pianist/composer Mark Flugge, who passed away earlier this year.